Dark chocolate salted caramel cupcakes are decadent, made with moist dark chocolate cake and topped with salted caramel buttercream. Mocha cupcake goodness! Despite today being Monday, I am not feeling the usual Monday blues because of the wonderful wedding of the weekend. There is something about weddings that just puts one in a very good mood. Or I might just be a romantic at heart and it’s about time I stop denying it. My friend’s wedding was a beautiful fairy tale; one of those you see in a chick flick movie. The bride is a country girl and throughout the planning we struggled to combine that with a simple/ elegant theme. At the end of the day, she pulled it off perfectly. She got married in the beautiful backyard grounds of her childhood, above a creek where she rode down to the ceremony in a horse and carriage. Yes, not kidding. Her mother surprised her with that. It was super awesome and was definitely a tear jerker. The reception and party were held in an elegantly decorated tent, studded with shades of purple (regency and wisteria to be exact) and hints of the couple’s favorite pastime: fishing. We danced our (troubled) feet out till the wee hours celebrating the newlyweds. I am still recuperating from all the excitement and jello shots! Ok, I’m sure you are not here for wedding details but rather for these dark chocolate salted caramel cupcakes. I made them for friends last weekend during my birthday celebrations. They’re called dark chocolate salted caramel cupcakes, but the consensus was “Mocha chocolate goodness”. I think that describes them perfectly, because it’s a moist dark chocolate cake, topped with salted caramel buttercream. I made homemade caramel sauce, using this recipe from Two Peas and their Pod, using it in the frosting. The sauce is SO good on it’s own and we have been drizzling it on everything from ice cream to cookies. 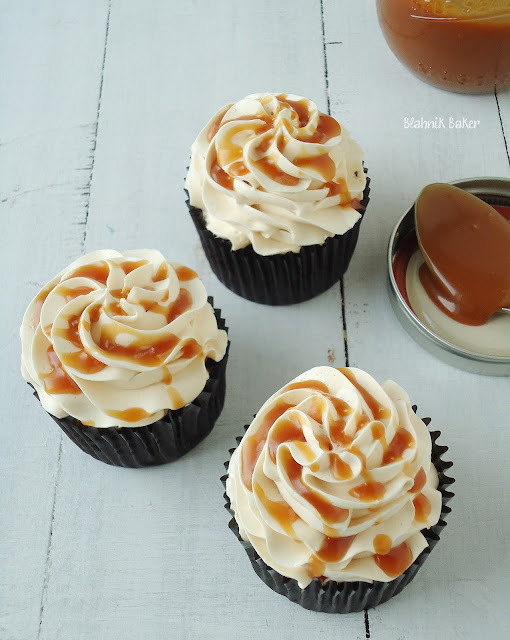 Next time I make these cupcakes, I will fill them with the salted caramel sauce for some added oomph. You totally should if you would like added salted caramel flavor! If you’ve ever had a salted caramel mocha drink at Starbucks, this is it in cupcake form. A very decadent chocolate cake with a sweet and salty topping! Enjoy these dark chocolate salted caramel cupcakes, and let me know what you think of the recipe! Whisk together sugar and egg whites in a heatproof mixing bowl set over (not in) a pot of simmering water. Whisk until warm and sugar is dissolved (mixture should feel completely smooth when rubbed between your fingers), about 2 to 3 minutes. Remove from heat. With an electric mixer on medium speed, whip the egg white + sugar mixture for about 5 minutes (using the whisk attachment). Increase speed to medium-high, and whisk until stiff, glossy peaks form and meringue has cooled (test by feeling bottom of bowl), about 6 minutes. Do not proceed if the bowl is still warm. Your butter will melt. Reduce speed to medium and switch to the paddle attachment. Add butter, one piece at a time, beating well after each addition. Continue beating until the butter incorporates into the meringue and a silky buttercream forms. It usually takes a few minutes, depending on whether your meringue was cool. Keep beating, it will come together. Once silky smooth, beat in vanilla extract and ¼ cup salted caramel into the buttercream. Mix until combined. 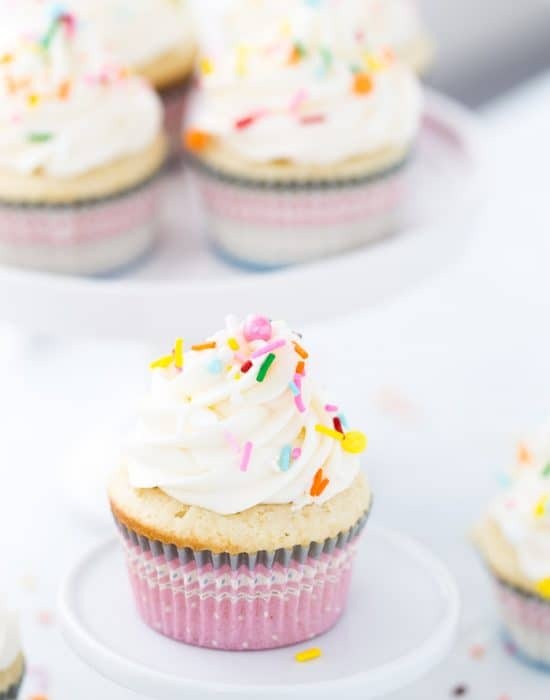 Use frosting immediately to frost cupcakes or store in an airtight container in fridge for up to a week. These cupcakes are absolutely beautiful! And I love salted caramel… in the frosting and drizzled on top? Yes, please! Thanks Renee. Salted caramel is a favorite of mine and now that I found a good homemade recipe I am so happy! Awww that wedding sounds BEAUTIFUL! I looove weddings! I also looove these cupcakes. I love dark chocolate. I love salted caramel. I.LOVE.THESE. It was beautiful. Weddings make me so happy lol! Shhhh, you can’t people what happened! Wow these cupcakes look amazing. Glad you had fun at the wedding! Thanks Sally! I had a great time at the wedding. Still catching up on sleep though. 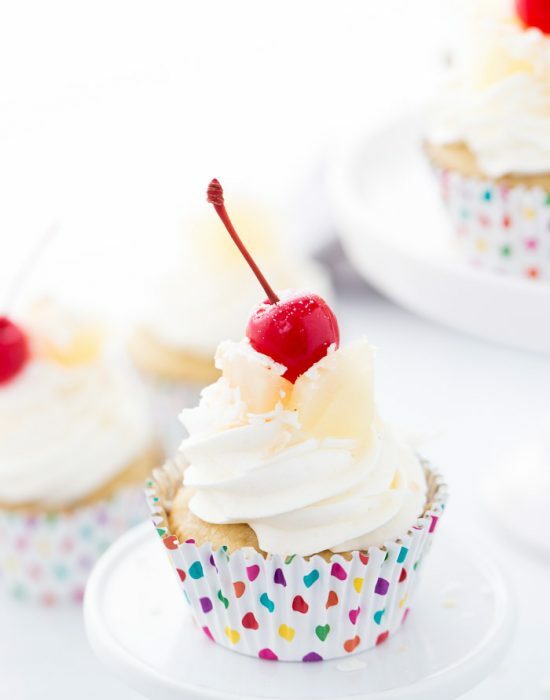 I always wondered how to make these cupcakes… gorgeous recipe. I hope you can try this one! 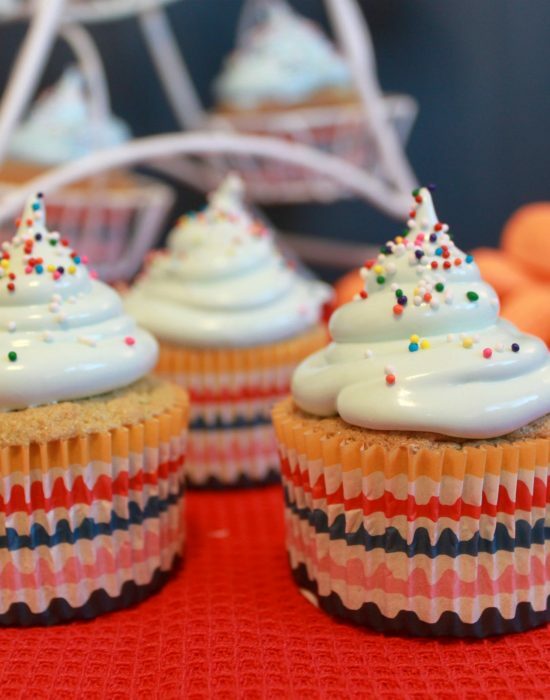 These cupcakes are right up my alley! That caramel sauce is so delicious too! They look great! I love salted caramel! Wow! These cupcakes look amazing! Love chocolate and salted caramel. Thanks for sharing the recipe! These cupcakes look like heaven! I’d like one right now please. I may have had too much fun! Silly me grabbed a spoon to eat the jello shots so the groomsmen decided to teach me the proper way. Wow those cupcake looks delicious, the way the caramel is drizzled on it so tempting. Aww your friend’s wedding sounds amazing!! As do these cupcakes. I kind of just licked the screen. Hahhah! No screen licking Joanne. These look incredible! Love the combination of salty and sweet! These cupcakes look perfectly perfect!! 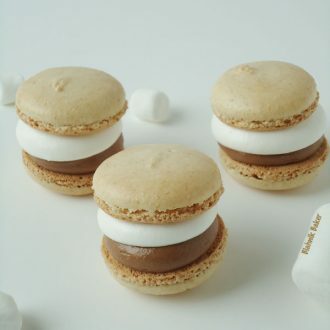 I love salted caramel and I’m so excited that you did a swiss meringue buttercream for these!! Those two are definitely a winning combination!! No there cannot be enough!! one of my favorites. they look great! Wow! 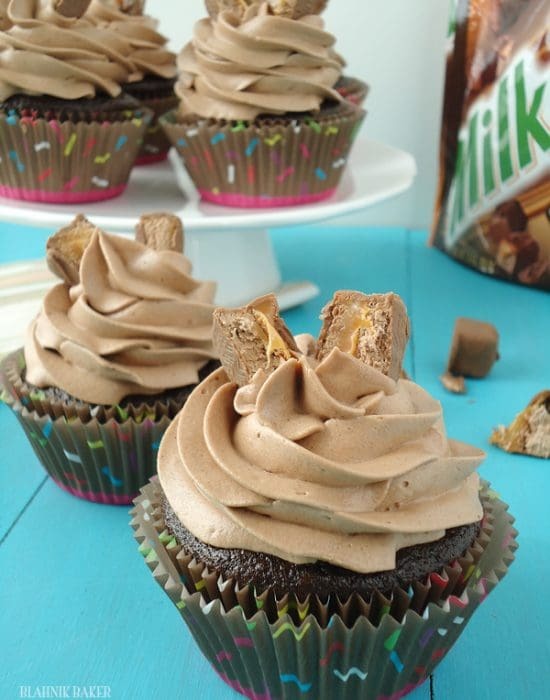 As a caramel fanatic, I give my hearty approval to these marvelous cupcakes! 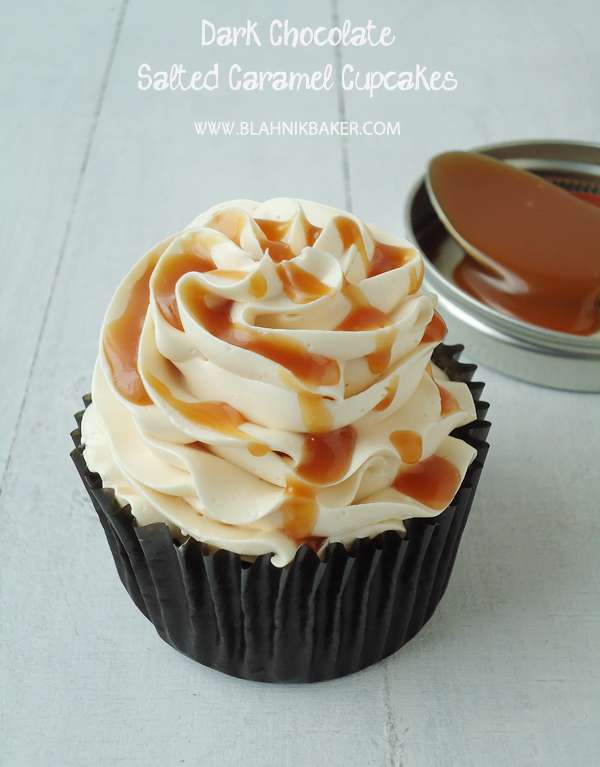 Love the drizzle of caramel over caramel buttercream…totally irresistible! Yay! I’m glad you approve Liz! I LOVE dark chocolate! These cupcakes look amazing! Oh yea, these are super fantastic. Zainab! And they are so beautiful! Thanks for sharing at MM. Pinning and sharing on FB and Twitter! Zainab, these look BEYOND amazing! What a perfect way to come back from that dreamy fairytale wedding. 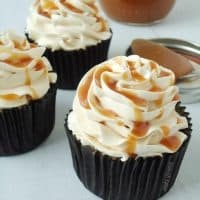 I have made caramel sauce exactly once with success and have been too scared to try again in case I mess it up 🙂 But I just might have to take the plunge to top these gorgeous looking cupcakes! Thanks Aniko. I’ll hop over now to visit your party! I don’t really need the cupcake, just pass the salted caramel please! Thanks for linking to the In and Out of the Kitchen party! I am always glad you share with me! I will be pinning this! Hahhah I agree the salted caramel stands on it’s own! Beautiful post! I just bought some of this French salted caramel in Berlin (which cam in this super snazzy ketchup squeeze bottle thingy…) This looks like the perfect thing to squirt it on! Great pictures! I love your piping technique, and salted caramel with anything is just pure delicious! Thanks! I used the wilton tip 1M here. I really need you to come and visit m with one of these right now. Pinned. I know! Next time, I’m in London I’ll definitely let you know. You had me at ‘Caramel’. Thank you for stopping by and commenting on my peaches! Thanks Tammy for visiting too! Thanks Eva. I’ve corrected that mistake! Visiting from SITS! Those look divine! Your cupcakes look too die for! DAng girl, these are some fancy cupcakes! Love the dark chocolate / salted caramel combo! Oh these look delicious. Chocolate and Caramel are amazing together. Now I need an excuse to make cupcakes. oh that buttercream looks amazing! Thanks Amanda for the feature! Oh my goodness these look absolutely divine and delicious! Thank you so much for sharing your beautiful food at our “Best Of The Weekend” party! I will be pinning all to our party board and to another big board as well. We hope to see you back on Friday when the next party kicks off at 8PM EST and hope you have a wonderful week! Claire thanks for sharing! I’ll be there of course! Holy delicious! Mouth watering! Thanks for sharing at Sweet & Savory Saturdays #26. May I say, “YUM!” I think I may, and thus I did. Yum yum yum!!! Excited to try these! Just wanted to let you know you’ve been featured on Work it Wednesday! Zainab, You’ve got me drooling everywhere with your fabulous photos! Chocolate and Caramel , yummy, I’ll take a dozen please! I just have to feature you this week at Thursday’s Treasures, and, I’m also featuring you on my FB page! Thanks for sharing! Thanks Joan!! I can’t wait for the party tonight. I had a lot of school work to do Sunday afternoon, so I made these cupcakes. 🙂 It was a great way to postpone writing lesson plans! I had never made caramel, salted or otherwise, so this was a true learning experience. In the future, I will turn off the heat before it gets to the prescribed temp, because even though the heat is off, the pot stayed hot, and the caramel continued to cook. I increased the amount of caramel in the frosting to give it a little more flavor. I took a few cupcakes to school, and had a few co-workers try them out, and they were a big hit, even with the slightly overcooked caramel. One friend said the only reason she was still standing at the end of the day, was the cupcake I gave her at lunch. Not a bad way to start the week before Labor Day. Just did a batch of these, spread out all over cupcake pan and not baking thru. I keep adding minutes. Followed recipe exactly. Of, course making them for a block party. Beautiful picture, but bad recipe, at least the batter. I am sorry to hear this and without being in your kitchen I cannot say what may have gone wrong. However, I’ve used this chocolate cake recipe multiple times and I’ve never had a problem with the batter. It’s runny after mixing but bakes up nicely. Maybe you overfilled the cupcake tins and this caused the batter to overflow?? Again I’m sorry about this. even better than starbuck’s. 🙂 this was amazing – we’ve blogged about it here: http://dancingwithmyfather.net/?p=93 with a link back to you! Hi! These look and sound fab and I’ve selected them as my birthday treat (my husband will be doing the baking!) He wants to do them as a layer cake, though. What modifications to the recipe would he need to make in that case? Since it only makes 12-15 cupcakes, would he need to double the cake recipe and buttercream to have enough for two layers? And do you know the bake time on a 9-inch round instead of the cupcakes? Thanks so much! It’s me again–I finally had the cake! Better late than never! My husband was supposed to be making it for me for my birthday (Nov 20) but I got a stupid cold virus for my birthday instead and had to put my cake plans on hold (because when I can’t breathe, I can’t smell, and when I can’t smell, I can’t taste. Not sure if you experience that too or what!…) I’ve been dreaming about the cake and finally decided that yesterday was the day. The recipe was too advanced for my husband so I ended up making it myself while he attended to sous chef duties. The cake baked up nicely as a layer cake; I doubled the recipe and baked it as you suggested and it was done around the thirty minute mark, just like you said. I left the frosting recipe alone, frosted the cake generously, and still had ample left over such that I used some to decorate the top in little floret shapes. Then I drizzled some salted caramel on the top and used my microplane to make chocolate “snow” on there, too. It looked nice (I’d love to post a picture but I don’t see a way to do it.) It tasted good, too. As a matter of fact, I think I might use the chocolate cake recipe as my go-to chocolate cake from scratch. For me, it had a rich, chocolatey cake flavor and was a moist cake (my husband and I both find chocolate boxed cakes tend to be on the dry side and we hate that). I was disappointed not to find the coffee flavor very pronounced (I couldn’t really taste the coffee in there at all, but my dad, who isn’t a coffee drinker, said he could taste it and that it was the one detractor in his mind. So to each his own, I guess. Lol.) and would like to bump up the coffee flavor in future runs of this cake. Do you think adding some coffee extract would do it? Thanks for your help modifying the recipe for the layer cake platform–I really appreciate it. Take cake and happy baking! Natalie, I am so happy to hear that you loved the cake!! This chocolate cake is truly the best and my go-to recipe for chocolate. I am not a coffee drinker and I do think (like your husband 🙂 ) that teh coffee in the recipe is present but not too much. But I do think for a coffee lover like you, you could increase the amount of instant espresso in the recipe or use a 1/2 teaspoon of coffee extract to bump up the flavor!! Sounds like it would be very mocha-y!! I’d love to see your birthday cake picture…if you don’t mind. You can share it on my Facebook wall!! I’m a huge fan of layer cakes and always looking for decoration ideas…yours sounds beautiful. Thank you again so very much for the update and I am so glad to hear you loved the cake. PS: I am sharing a peppermint mocha cupcake recipe this Friday I have a feeling you will love. Lot more coffee in this. Come back please and check it out! I followed the icing recipe to a “T” and the icing was separated and difficult to work with, no where near the appearance of the picture above. I have made an Italian frozen dessert that uses the same Meringue technique, no problems there. Suggestions? Tastes delicious though. Hi Chelsey. I’m so sorry to hear the frosting was difficult. The recipe is a classic Swiss meringue buttercream and when you add butter to the meringue base it separates. But just keep beating and it should come together. Sometimes if you don’t let the meringue cool before you add the butter, it melts the butter and it’s hard to cine together. In that case, refrigerate the bowl for 15-20 minutes. I hope this helps. I’m sorry again that the frosting is being challenging. But I’m glad it tastes great! Wow! These look amazing and I bet they taste even better! I cant seem to find the recipe, is there a link i am missing? It’s back up! Sorry there was a glitch for a few hours. I am looking for the recipe, where can i find it? Hi there! 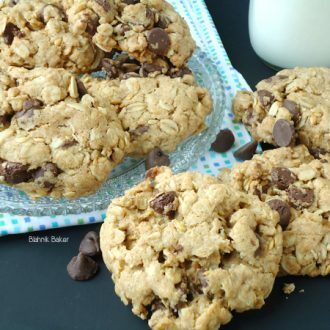 Thank you so much for sharing this great recipe! As I am not planning to bake too many cupcakes, I was wondering if I could halve the recipe? Thank you! Hello Aisha, you can cut the recipe in half but I am just worried about the egg since it calls for just one. If you don’t mind, whisk one egg in a small bowl and measure out half of that amount into your cupcake batter. Hope that helps! Hi! I made the cupcakes and they tasted great! However, they did sink in the middle and I don’t know where I went wrong. They tasted so good that I decided to give them another try as a layer cake and the layers sunk so badly that it looks like a pie crust. Any suggestions on what may have gone wrong? Hi Guili! I am so sorry to hear they sunk in the middle. It sounds like either a baking powder/soda issue or your oven temperatures are not consistent. I know using really old baking powder before has left me with collapsed cakes (I haven’t had cupcakes done that yet). However before I understood my oven, my cupcakes used to not rise well because the temperature was fluctuations and uneven. Once I got an oven thermometer I was able to figure this out. I can’t be sure that either of this May have happened for you but in my experience those have been some of my failed cake/cupcake reasons. I’m glad they tasted good though…for the cakes did you bake in 8 or 9 inch? And did you give them more time? I made these last month & they were a hit @ work! Next w/e I will be doing 4 graduation cakes, 2 chocolate & 2 white (same person) Going to do a trial run today to see if they will turn out in a 1/2 sheet size pan. Do you think I need to make any adjustments? Haven’t searched your site completely but hopefully you have a white cake that equally as fantastic as this one! I have always ended up using boxed mixes as I never have luck with from scratch recipes until I found yours! Kim I’m so glad to hear you loved these cupcakes. I’ve made them in round cake forms (8 and 9-inch) and they turned out great. Didn’t change the recipe at all. So I don’t think you will have to for a sheet cake. Just make sure you don’t fill the pan too much and leave room for the cake to rude. Also, adjust the baking times. I think it might take almost 25-30mins for a full sheet cake. But start checking the center around 20mins. I hope it turns out great. Please let me know how it does!! OMG! This is SO delish! Just enough caramel in the SMB. I used another recipe for the cupcakes, but this SMB is to die for. Hey, may seem like a silly question but for the frosting, granulated or confectioners (powder) sugar? Granulated sugar! I’ll specify above! Oh eM Ghee… I made these for my daughters’ 13th birthday they are amazing… I will be using this chocolate cupcake recipe from this day forward. I live at high altitude and the buttercream frosting wouldn’t stay together! The frosting and the caramel sauce kept separating from each other. I had a friend who lives at sea level and she had no problems. Just a warning! Shelby, I am so sorry to hear that. Tried The Dark Choc. 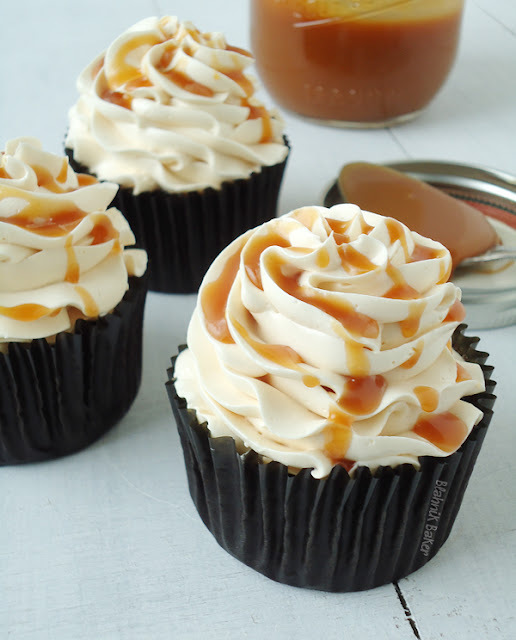 Salted Carmel cupcake recipe. The frosting was very runny. Placed it in the frig for 6 hours hoping it would thicken. While the taste was wonderful, it still ran off the cupcakes and on to the plate. Needless to say I am so disappointed. Please tell me what I did wrong. Hi Helen, the frosting is a swiss meringue buttercream which incorporates butter into whipped stable egg whites. it does take time for this to happen and you need to keep beating it with your mixer until the butter is incorporated. If your egg whites were still warm, which is what I suspect here, the butter will melt and never incorporate. Usually chilling the entire bowl and mixture for 15-20 minutes will help the butter incorporate when you start mixing again. I am sorry it was runny, it shouldn’t have been. My guess is you didn’t beat the mixture long enough for the silky frosting to form and/or the egg whites were still warm to the touch when you added in the butter.